Anton Stankowski was born on 18 June 1906 in Gelsenkirchen, Germany. His most important teacher was Max Burchartz at the Folkwangschule in Essen, where — after completing an apprenticeship and his journeyman years as a decorative painter — he studied for three semesters, starting in 1926. After a short stint free-lancing for the Canis Advertising Agency in Bochum, the 23-year-old Stankowski was invited toward the end of 1929 to work at Max Dalang’s famous advertising studio in Zurich. This marked the beginning of an important time: Stankowski’s photographic and typographical work developed into a prototype for a contemporary advertising style, later called “constructive graphics.” Stankowski quickly made friends with people who later became known as the “Zuricher Konkreten,” Richard P. Lohse, Verena Loewensberg, Max Bill, and others. In 1934 Stankowski lost his work permit and he moved to Lörrach, Switzerland, before finally returning to Germany in 1938. 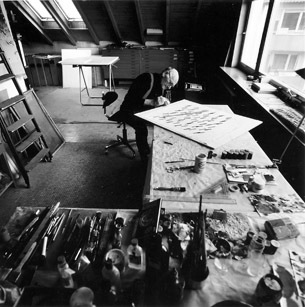 In 1939 Stankowski founded his Grafische Atelier in Stuttgart. Shortly thereafter, he was drafted into the army and had to go to war. After the war, he connected with leading characters of the visual movement, such as Baumeister, Hugo Häring, Kurt Leonhard, Mia Seeger, Egon Eiermann, Max Bense, and Walter Cantz. Thanks in part to Stankowski’s work, Stuttgart became a Mecca for graphic design in the 1950s. In 1972 Karl Duschek became a partner at in the Grafische Atelier, and important designs were developed for companies such as the Deutsche Bank and the Münchner Rück insurance company, for example. Increasingly, Stankowski concentrated upon painting, devoting himself to it completely until his death in 1998. During his lifetime, Stankowski received many honors, such as an honorary professorship from the State of Baden-Württemberg, the art prize from the City of Stuttgart, and, in the year of his death, the Ehrenpreis des Deutschen Künstlerbundes — the Harry Graf Kessler Prize — for his life’s work.